To make this transformer cake, I made 2 9x13 Chocolate cakes and filled them with chocolate confetti filling. I iced it with vanilla buttercream icing. 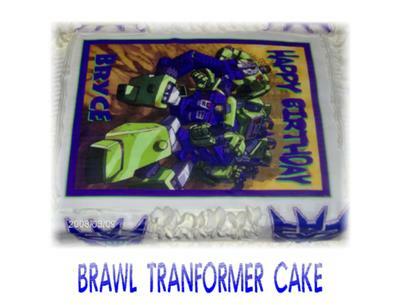 I made an icing image of the brawl tranformer and applied it to the top and sides. How do you do the design? Hope you can give me instruction. I love you work. Thanks.